Intimate portraits of young siblings are rarely this raw and authentic. 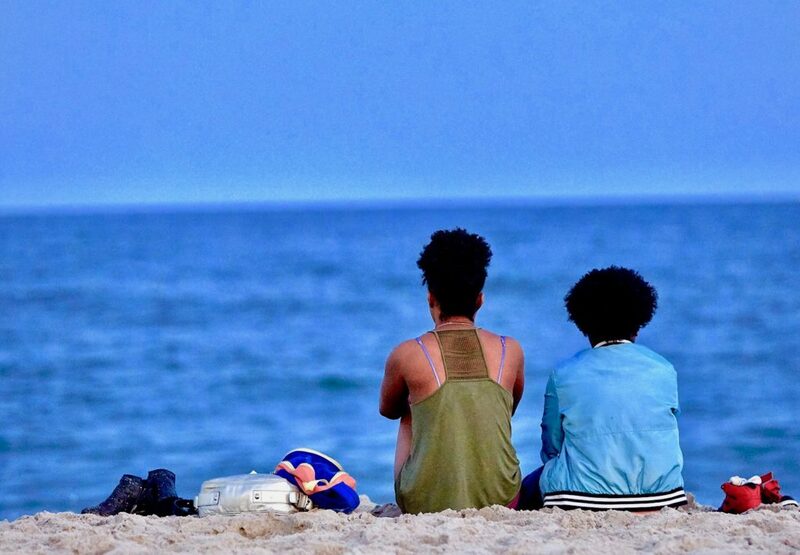 There is something special and magnetic about the relationship between this orphaned 18-year-old black girl and her supportive 10-year-old sister. Actress turned director Jordana Spiro (best known for Netflix series Ozark) co-wrote the script for Night Comes On with Angelica Nwandu. Their story follows Angel LaMere (Dominique Fishback, HBO’s The Deuce), who has just been released from a juvenile detention center in Philly where she did time for possession of a deadly weapon. She has a sketchy relationship with her parole officer (James McDaniel, NYPD Blue); she’s hardheaded and he is skeptical about her motivation for rehabilitation. Rightly so. Angel’s been in and out of 13 foster homes, where abuse and violence were the norms. Her dad murdered her mom. She’s been separated from her young sister Abby (Tatum Marilyn Hall). And upon her release, her ex-lover Maya (Cymbal Byrd) is giving her shade and has moved on emotionally. Not much to live for, but memories of her mom’s caring advice and dreams, of them at the ocean shore with the sounds of waves rushing in, sustain her as best they can. Watching this young vulnerable soul, who is adrift in so many ways, pulls you into her desperation. As she seeks revenge for her mother’s death, buys a gun and contemplates killing the father who’s responsible, your interest is locked and loaded too. Something is going to happen. You’re on the edge of your seat and the tension lasts around 75 minutes of this 87-minute film. What’s on view, from first-time filmmaker Spiro, is a talent for getting to the heart of scenes, ably depicting the two leads’ turmoil and moving the drama along at a nice clip (editor Taylor Levy). The footage is clear, the colors rich, the lighting on the brown skin is incandescent and the composition of each shot is flawlessly beautiful (cinematographer, Hatuey Viveros Lavielle). Spiro has surrounded herself with the right crew. Given the astute direction and the most flattering photography possible, it is up to the two young actresses to carry the rest of the movie, and they do. Most of the time you feel like you’re walking down the street with Angel, as she stumbles into a string of wrong decisions. You want to reassure her that she is in charge of her life and things can get better — though you know, there is no quick fix for her horrific past and seemingly dismal future. You’re duly hooked into Angel’s dilemma because Fishback deftly portrays her bitterness, determination and love, all at once, in a world that has deserted her. Fishback’s performance would be the film’s strongest element, except she’s often upstaged by the very precocious, brainy, articulate and gifted Tatum Marilyn Hall. Hall’sacting is seamless and natural. Her interpretation of Abby is that of a kid who is well beyond her years and provides the one anchor that can keep her older sister moored to reality and basic human values. If anyone can save Angel from committing a homicide, it’s her little sister. Angel asks Abby, “Do you think I’m like him (dad)?” Fishback deserves other leading film roles. Hall deserves her own TV show. The proceedings build and build to an ending that is not climatic enough for all the previous dread and anticipation. Not making the third act as stomach-churning and tense as the first two acts is a flaw. Never showing the murder that haunts the girls is also an iffy choice. The array of talent—Spiro, Nwandu, Lavielle, Fishback and Hall—is enough to separate this film from a crowded field of low-budget indie movies that don’t have nearly this much heart and vision. Night Comes On is a memorable and intense family portrait.